I am not really sure what to even say...except that this is Ethen's new favorite 'outfit'. I think that he is good at accessorizing, and not so good at the basics. 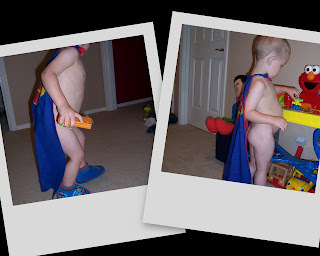 He is wearing his 'cake' and 'boots' (aka - his superman cape and his Thomas the Train slippers).